A driver has been captured on dash-cam footage travelling in the wrong direction along a motorway - moments before a serious crash involving two other vehicles. Police said no-one was injured in the accident on the M6 Toll near Cannock, Staffordshire, during Wednesday's evening rush-hour. 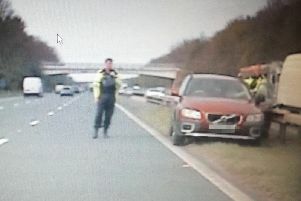 A short film posted on Twitter by another motorist, who was driving on the southbound carriageway in the middle lane, shows what appears to be an Audi hatchback in the outside lane heading north. One car is reported to have been extensively damaged in the crash. A spokeswoman for West Midlands Police said: "A woman in her 60s was driving the wrong way and collided with two vehicles. There were no injuries and no arrests have been made."